We joined the first few tourists to enter Chichen Itza when it opened at 8am. 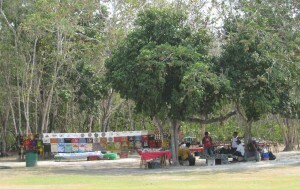 The site was almost deserted when we arrived; vendors were only just beginning to set up their goods. All around us were the monuments Stephens featured in the drawings in his book. While some of these buildings are restored in part, there is still a mystery around their original purpose that even our resident archaeologist cannot penetrate. 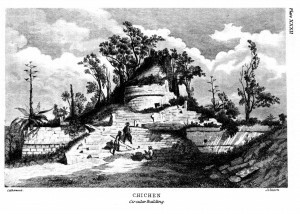 We can only gaze at these monuments to a Maya past, since tourists are no longer allowed to climb the steps to the top of the pyramids; nor can we build fires and camp inside the structures as Stephens’ party did. But Stephens’ original images can be re-imagined in what we see. After listening to Heath Anderson’s interpretation of the feathered serpent motif that appears almost everywhere we looked, these people were not peaceful, but relying on the movements of Venus to plan warfare on a large scale. Of course, this more recent interpretation is based upon archaeological evidence collected after Stephens’ visits. By the time we returned to the Hotel after our first tour of the site, today’s Maya vendors had arrived in force; many offering the identical “authentic” objects for sale. 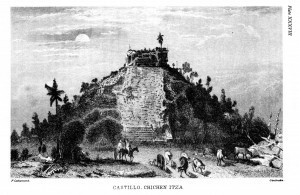 While I write this, my compadres are taking another tour of Chichen, this time with a “real” tour guide recommended by our waiter at breakfast this morning. The second tour promises to compliment the one Heath offered us and promises to provide yet another interpretation of this tourist site. We are staying at a wonderous hotel called Mayaland, located within twenty feet of the archaeology site. We are spending our nights in Maya bungalows, with genuine thatched roofs (and birds and bugs). 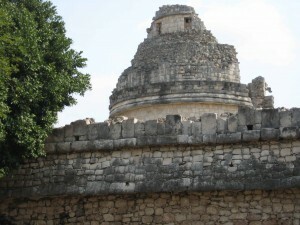 The other place for visitors to this tourist site is Hacienda Chichen Itza, where we will visit later this afternoon. 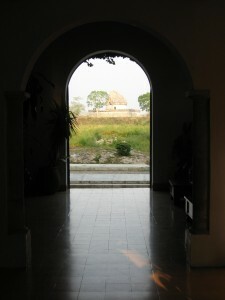 We understand that the owners of the Hacienda only sold the archaeology site to the government of Mexico last year. I have remained behind to write this blog and to schedule our trip to the Yaxkin Spa that is part of this Hacienda where we will all experience the Pakal Ritual later today. As the web site promises, tourists that visit the Spa will “experience the beauty ritual created for Maya kings to purify and prepare mind, body, and spirit to meet the gods in mystical visions.. . .rooted in sacred Maya healing practices. . .this relaxing and purifying spa care will regenerate your peaceful energy and beauty”. After spending today in the sun and humid heat of Chichen Itza, we will all need it. 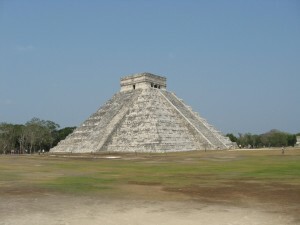 More importantly, our visit to this spa created entirely for tourists, promises to offer more insight into the tourist experience here at Chichen. 2:12 pm. from the patio of the Hotel, next to the coffee bar.